-Mimi Beardsley Alford, who had an affair with John F. Kennedy while she was an intern in the White House, will tell her story in a memoir to be published by Random House. Mimi Beardsley Alford, a retired New York church administrator who had an affair with John F. Kennedy while she was an intern in the White House, is breaking a silence of more than 40 years to tell her story in a memoir to be published by Random House. Mimi Beardsley Alford, pic left, was an intern for John F. Kennedy. 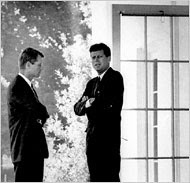 AP pic right shows John F. Kennedy, right, with Robert F. Kennedy at the White House in October 1962. Ms. Alford’s secret was initially divulged six years ago when a biography of Kennedy was published with portions from a 1964 oral history that described the president’s 18-month sexual affair with a young intern named Mimi Beardsley. The Daily News tracked her down and discovered that she was Marion Fahnestock, who was divorced, working for the Fifth Avenue Presbyterian Church and living in Manhattan. At the time, she gave a short statement confirming that she was “involved in a sexual relationship” with Kennedy from June 1962 to November 1963. Ms. Alford, 66, who in the years since the disclosure had married Richard Alford, a former sports marketing executive, has not spoken about her affair since the statement. Before that, she had not even told her parents or her children. Now she is working on a memoir, to be titled “Once Upon a Secret,” about the consequences of hiding such an explosive past for so long. Susan Mercandetti, executive editor at Random House, acquired the book after seeing about 20 pages and meeting with Ms. Alford. “I’ve seen enough to know what an extraordinary heart and soul exists in this book,” Ms. Mercandetti said. She added: “It’s about a loss of innocence. I was just completely struck by how simple, yet how profound, it was.” She declined to say how much Random House had paid for the book, but a person familiar with the negotiations said it was close to seven figures. Read Rich's full story at NYT.